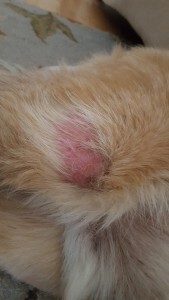 Hot spots, or Pyotraumatic Dermatitis (PTD lesions) are a very common condition veterinarians see in pets, especially during the hot summer months. Hot spots occur when there is a break in the skin’s natural barrier and these areas become infected with an overgrowth of bacteria and/or yeast. This condition may present as small superficial lesions anywhere on the body or can be very deep, painful infections covering a larger area. Hot spots can be seen in both dogs and cats. Dogs with thick under coats, such as golden retrievers, are especially susceptible to this condition. Hot spots occur when an animal starts excessively licking, chewing or grooming an area of their skin. This behavior is most frequently triggered by itching from allergies. Another common cause of hot spots is flea infestations which may present as crusts around the rump and the base of the tail. The location of a hot spot can also give your veterinarian clues to the existence of other underlying problems in the body. For example, abrasions on the neck or cheek may be due to scratching at an ear infection. Scabs on the side of the face can be an indication of a tooth root abscess. The pain from arthritis can incite an animal to excessively lick the skin over the effected joint. Obsessive licking of an area can be an indication of a compulsive behavioral disorder. If your pet has some lesions that look like a rash, your veterinary may perform additional tests to rule out underlying conditions other than allergies. Some of these diagnostics include skin scrapings to identify mange, fungal cultures to test for ringworm, cytology and cultures to identify bacteria and yeast and biopsies to rule out autoimmune conditions and cancer. The treatment of hot spots usually consists of your veterinarian clipping the hair of the affected areas so that the lesions can be properly cleansed and allowed to air out. The clipping of the area will also help determine the extent of the skin affected. Sometimes the hot spots are so painful, that your pet will need to be sedated in order to treat and medicate the lesions. Oral and/or injectable antibiotics are typically administered to control infection. Medications to help alleviate the itching, such as antihistamines and corticosteroids, are usually given. Topical treatment, such as medicated shampoos, conditioners, sprays, and ointments are also indicated in the treatment of the hot spots. Laser Therapy is an excellent additional treatment choice for alleviating the discomfort and inflammation of hot spots – more on our Class IV Laser Therapy in future posts. Dietary supplements, such as omega-3 fatty acids, are another useful tool for the treatment and prevention of hot spots. 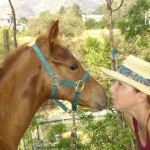 Your veterinarian may recommend allergy testing to identify specific allergy causing “culprits”. How are Hot Spots Prevented? It is virtually impossible to eliminate all allergens in the environment, such as pollen and dust. However, fleas and ticks can be controlled which is an extremely important component of hot spot prevention. There are many convenient and effective flea and tick control products in today’s market. Your veterinarian may also suggest a specific diet to eliminate food allergies as a cause of hot spots. Routine grooming, especially for certain breeds and for dogs that swim frequently, can play an important role in prevention. For more information, please contact Sheryl Fulop, DVM at DrFulop@InHomePetVet.com or call her at 1.818.309.3021.